Since our daughter was born, I've been thinking a lot about how to expose her to science, math, and technology in a way that was fun and approachable and somewhat integrated into her normal play. At some point, I heard about the LilyPad Arduino, and thought it was a perfect opportunity to do some electronics programming in a way that she might think was fun. The LilyPad had several things going for it. First, it was purple which was almost as good as pink as far as she was concerned. Second, it was designed to be sewn onto fabric, which seemed much more approachable than a traditional electronics project stuck into a plastic box. It had been a long time since I had done any soldering or electronics work, so it also seemed a lot simpler for me to work on as well. Since I didn't really know what I was getting into, I figured I would start with something simple. 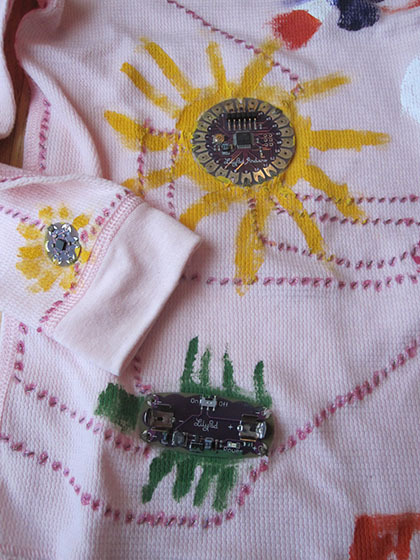 The plan was to copy the accelerometer shirt project on Leah Buechley's site but to add a small amount of customization. The basic design is an accelerometer on the cuff of a shirt and an RGB LED. 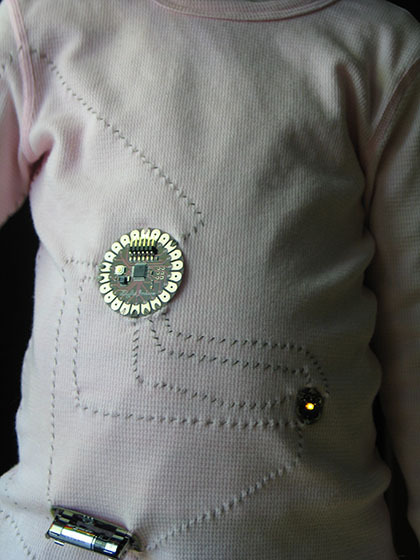 The LilyPad reads the sensor, changing the color of the LED based on the acceleration. I was going to do all the sewing and electronics work myself, and allow my daughter to customize the behavior of the light and paint the shirt. I sewed a basic circuit into a scrap piece of fabric, just to get a semse of how everything worked. It probably would have been easier to use craft foam and alligator clips for the prototyping, but I wasn't thinking that far ahead. Everything worked just fine, so I moved on to the actual shirt. Sewing the circuit worked relatively well. It was certainly less intimidating than soldering since there was no hot iron, and no possibility of creating a bad connection with bad techniques. (I've since gotten a lot more comfortable with soldering). On the other hand, I certainly could have benefited from more experience with sewing. I wanted to use one piece of thread from the LilyPad to the accelerometer. Since I had no clue how much thread I was really going to need, I grossly over-estimated and had to pull a really long string through the entire length of the trace. It worked in the end, but it made the sewing a lot more complicated than it needed to be. 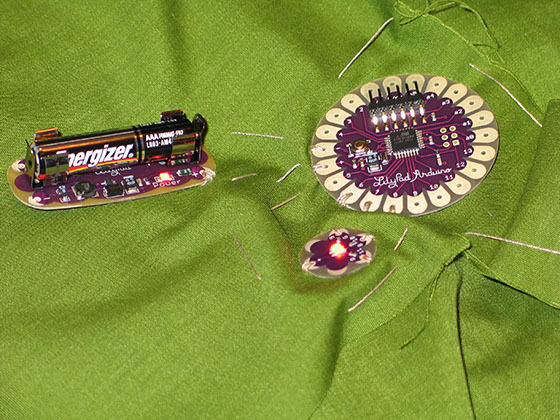 With the sewing complete, I programmed the LilyPad using the example code. I had to fix a couple of bugs in the code, but that just made it easier to understand. My goal of getting my daughter to specify different behavior from the default didn't really work out as well as I had hoped. She wanted the LED to switch between red and purple, which were relatively hard to differentiate when looking directly at the LED. I made some attempts to find some other solution, but we never managed to find a solution before we both lost interest in the project. 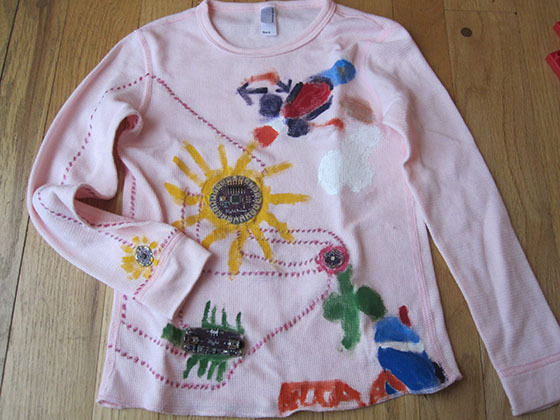 This is the shirt after being decorated. The LilyPad turned into the sun, the accelerometer turned into a star, and the LED became the center of a flower. She also added a swing set, a house, and a space ship with space bumpers (from a book we had read about female inventors). In the end, this was a rather successful project. My daughter seemed to enjoy decorating the shirt, and playing with it for a little bit. It didn't really get her excited about electronics, but it certainly exposed her to technology as something simple and fun. On the other hand, this project was my introduction to Ardunio, and sparked a host of other projects, many of which have inspired her to come up with her own ideas for cool things to make.